A couple of supernaturals are on the run from humans and have to try to keep themselves from being killed by them because they carry guns. There are a few safe houses around though, so they can hide from them but they can't stay in them long in case they're found and killed. One of the supernaturals that is on the run has a heart condition and has to be brought to a hospital or he'll die so they have to worry about that as well as the humans finding and killing them. This is the story of how they meet and also of how they try to survive. 2. Keep romance PG-13; if it looks like it might go past that, PM's are welcome. Personality: shy, stubborn, caring, kind-hearted, and protective. Sexuality: bi but mostly likes other guys. Other: likes Roan; weak around silver and wounds inflicted by silver anything weapons (bullets, knives, daggers, etc.) take longer to heal than wounds caused by regular weapons as well as when attacked by another werewolf but can heal quickly otherwise. he also has heightened senses and can shift at will and not just during a full moon. Appearance: - one eye is yellow and the other one is green to match his dual powers. Personality: kind, sweet, a bit protective, worrisome at times, can be annoying, and stubborn. Sexuality: bi and likes guys. Other: will like Hikaru later. He's short for a guy, being a fairy an all. Personality: He's shy around people he likes, but is very sweet and usually happy. He does tend to get scared easily and is a bit jumpy. He's a bit gullible and is not athletic. Other: Likes Rafe; and he has a heart condition which makes running too long or too fast very bad for him. His powers include making plants grow, healing, and flying (the wings of course). Personality: Hikaru is rebellious and can be serious at times if need be. He doesn't show or understand his feelings all that well. Last edited by Shadowfax278 on February 10th, 2015, 6:08:19 pm, edited 15 times in total. 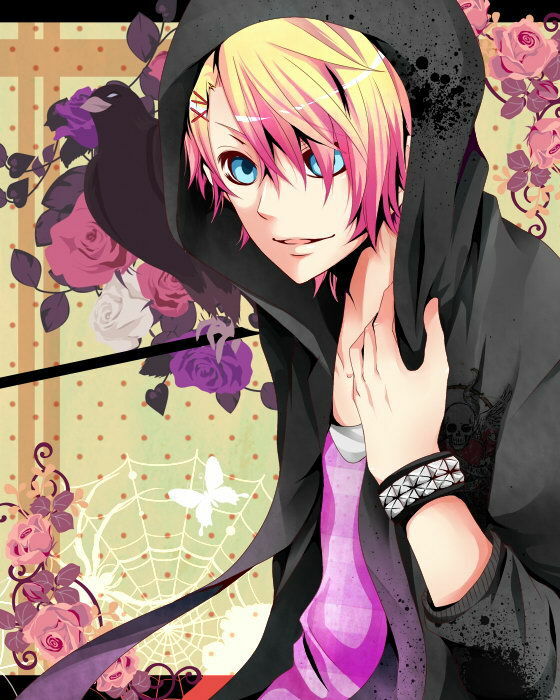 Personality: Hikaru is rebellious and can be serious at times need be. He doesn't show or understand his feelings all that well. Last edited by rosemilly on January 11th, 2015, 10:41:00 pm, edited 2 times in total. Rafe started to lead the way to a safe house in the woods that a doctor he knew and was also a family friend told them about that was deep in the woods nearby. "Just a little further and we'll be there," he said comfortingly to Roan before hearing a twig snap behind them. He quickened his pace slightly since he wasn't sure if it was an animal or a human that was chasing them but was careful not be too quick that it would cause Roan not to be able to travel very easily. Roan followed Rafe by foot, not flying since he was so tired. They had been on the run for a few days. "Rafe, I'm not sure if I can hold up too much longer." He jumped in fright when he heard a twig snap behind them, but he only walked a bit faster, knowing that if he ran he would pass out or even worse things would happen. At the moment, he was just scared and wanted to be in that safe house right at the moment. It was better than being dead. "Okay get on my back and we'll get there much faster so that you can rest," Rafe said in reply before shifting to his wolf form and then kneeling down so that Roan could get on his back. He waited patiently for him to do that and hoped that the sound that he had heard earlier had been just a squirrel or bird stepping on a branch and not a human footstep. If it was a human, they wouldn't be too lucky right now but he didn't want to think about it so he just shoved that thought out of his mind shortly after it arrived. The much smaller Roan, climbed onto Rafe's back, clutching onto his fur while pressing himself against Rafe. "I think we're good," he whispered quietly, closing his eyes and waiting for Rafe to begin heading to the safe house. "Rafe, can't you smell what that thing was?" he asked, trying not to think of the worst of things that could happen. He began to mutter softly to himself while attempting to keep himself calm, but it didn't really help. Once Roan was on his back, Rafe headed towards the safe house at a quick run but not too fast that the former might fall off. "It was a deer," he said in reply to the other's question a few minutes after sniffing the air of where the sound had come from. "I'm glad that's what it really was." Shortly after he said this other statement, they arrived at the door to the safe house that they had been heading towards. He knelt down again so that Roan could get off of his back and also so that he could shift back into a human again. Roan had ended up wrapping his arms around Rafe's neck as he ran, sighing in relief after he heard that the thing was a deer. "We never know anymore, Rafe," he replied back. He had climbed off of Rafe's back when they had stopped, walking up to the door of the safe house. He knocked on the door, a bit cautious before walking into the building as he saw a few other supernaturals in the room. They all seemed to be really worn out. "That's true," Rafe had replied to Roan's reply to what he had said about what the sound had been earlier and now shifted back into his human form as the former knocked on the safe house's door. He then followed him into the main room of the house, seeing a couple of other supernaturals there that looked as worn out as them. "Let's see if we can find a room to sleep in later," he said before heading down the hallway to where he thought the bedrooms were. Roan nodded and stayed close to Rafe, following him down the hallway. The safe house was a bit crowded, being one of the few safe houses in the area for supernaturals. He gently held onto the hem of Rafe's shirt so that the two wouldn't get lost or separated. "Rafe, I think that room's open," he told the other in a soft and quiet voice. "Do you want to sleep in there?"